boiling of sap and charring of stems of small trees and shrubs. unburned areas that promote future structural diversity (2003). (yellow) dominated the lower lying areas by summer, 2003. Propose an explanation of how fire preferentially favors growth of certain species such as Indian Grass with respect to environmental factors (e.g. light, soil fertility, soil temperature) and physiological factors (e.g. seed germination). Fires started by lightning or other natural means plays a key role in many natural ecosystems. Prairies are a primary example. Native Americans are known to have set fire to prairie areas to enhance the quality and quantity of grazing land for wild game. 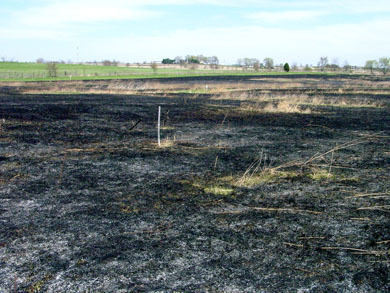 They had learned that prairie species flourish in response to fire which releases nutrients into the soil. 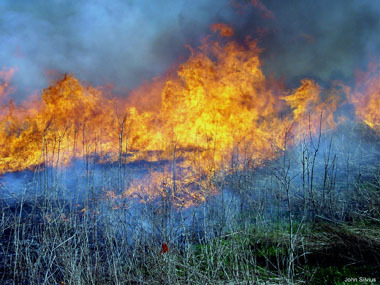 They also used fire to increase habitat diversity, food, and nesting sites both within the treeless areas and in the boundaries between forest and prairie. Frequent fire in biotic communities tends to favor plants and animals that have suitable adaptations to survive fire and flourish afterwards. These in turn produce offspring with genetic traits such as fire resistant bark which favors their survival. Because this principle of natural selection is true, we chose to introduce fire as an "ecological disturbance" to increase the survival and reproductive success of the prairie-adapted species we had sown. Along with the repeated sowing of prairie plant seed in the spring of 1999 to 2001, we also partnered with Wildlife Biologist, Lynn Holtzman, and the ODNR Division of Fish and Wildlife to burn the CU Prairie Restoration in Spring, 2001 and 2003. Our goals were similar to those reported of the Native Americans; namely, to favor the prairie species over the agricultural weeds and to increase the diversity of habitats within the field. In the wake of the fire, as shown in the photo (left), the landscape appears like a mosaic of burned and unburned areas. We hoped that these would create different soil microclimates which would, in turn, provide a variety of conditions of moisture, nutrients, and plant community "architecture" that would, in turn, influence light penetration, soil temperature, moisture, and so on. The next prairie burn would further diversity this mosaic as a result of the many factors influencing the progression of the fire. 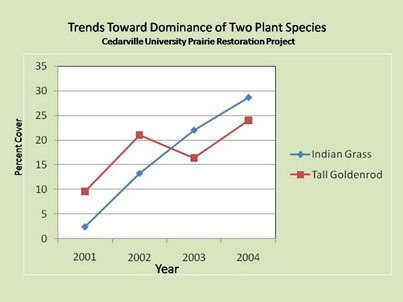 Introduction of prairie fire into the restoration efforts in spring of 2001 and 2003 did increase the percent cover* of several prairie associated species, chiefly Indian Grass, Partridge Pea, Switchgrass, Black-Eyed Susan, and Little Bluestem. However, this increase came at the price of a ever increasing dominance of Indian Grass and Tall Goldenrod. The photo at lower left reveals what the data reported in the chart below illustrated quantitatively. The two rounds of prairie fire and perhaps other related factors appears to stimulate an increasing dominance by these two perennial species. 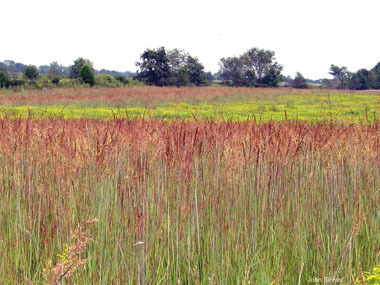 Indian Grass and Tall Goldenrod rely on cloning via tillers and rhizomes and can effectively crowd out other species. By 2004, the combined percent cover for these two species amounted to 52% of the total cover of all species combined! Can you suggest particular environmental factors that would become limiting factors to less successful competitors? It is clear from these data that fire alone cannot lead to a successful establishment of prairie with a diverse flora. The next page describes our more recent approach in "Dealing with the Dominants ." *Percent Cover for each plant species is based upon quadrat sampling and visual estimation of the number of nested sub-quadrats each species occupies; then, expressed as a percentage of the total cover of all other species combined.